Download the Heading settings demo PDF. Alongside the requirement that the tags correctly represents the logical reading order of the document, the most basic requirement for accessible PDF is that content be tagged appropriately. Why do you have to tag headings? You can’t tag tables as images, for example. It’s also not OK to tag all of a page’s text into a single paragraph (unless it really is a single paragraph). When it comes to headings, appropriate tagging is especially important. If all headings are tagged and only headings are tagged as headings, assistive technology users have a reliable means of navigation. If the heading levels are logical, that is, if they descend in sequence without skipping, then AT users have the means of reliably and efficiently navigating even very long or structurally complex documents. Almost any document longer than a few pages includes headings to organize paragraphs into logically distinct sections. Ensuring functional accessibility means paying attention to the logical organization of content, as you would when building a table of contents. When creating documents with accessibility in mind, it’s important to ensure that headings are not only indicated as such but tagged correctly. Heading levels should descend without skipping; H2 should follow an H1, H3 should follow an H2, and so on. Without consistent, accurate heading levels AT users can’t rely on heading levels for effective navigation. Open the PDF page in the Verify and Remediate or Logical Structure Editor modes. In the Physical view, select a heading by drawing with the mouse. The text runs are highlighted in the logical view. Use the Add heading toolbar or menu, or Cntrl 1-6 to tag the selected text runs with a Heading tag. If you are prompted for single or individual parents, select single to place all of the text runs into one heading tag. 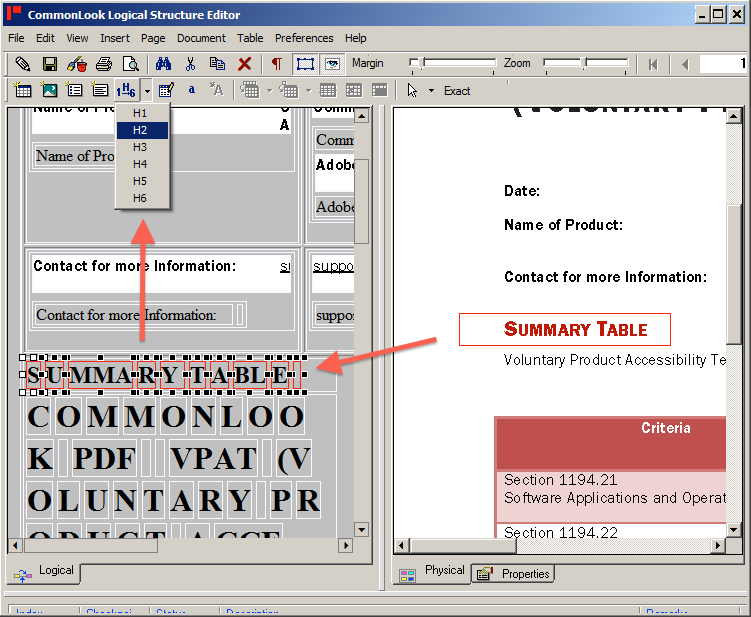 The product documentation provides more information on setting heading tags using CommonLook PDF. In these Tips, we provide individual best-practice rules for tagging PDF documents. In each case, a specific situation is described, and model tags provided. If applicable, we also provide an example of incorrect tagging on the same point so that users can test their assistive technology to determine whether it supports the described feature. If there’s a Tip you’d like us to cover, please let us know! The demo file includes a case where a heading’s mistagged as a paragraph. Generally speaking, headings are recommended but not required. It’s possible to have an accessible document that entirely lacks headings. Once authors choose to include headings, however, accessibility rules apply. PDF/UA requires that headings levels not skip when descending. In other words, PDF/UA conformance says that H3 must follow H2, H4 must follow H3, and so on. WCAG 2.0 does not normatively require heading levels descend without skipping. Techniques are provided for HTML on this point, but not for PDF. The 2001 Section 508 requirements (§1194.22) do not mention heading levels.